Amid much talk of a new political party, a press conference will be held later this month where further details of the loose alliance of independent TDs will be revealed. 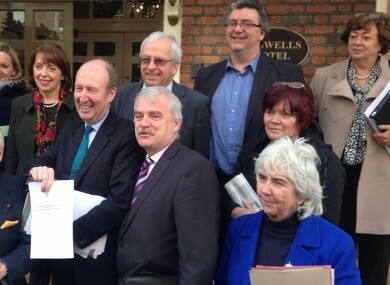 Some, but not all, of the parliamentarians in this photo will be involved in the new network. AT LEAST SIX TDs will formally launch a network of independent candidates running in May’s local elections later this month. The network is being launched by an alliance of independent deputies including Catherine Murphy, John Halligan, Thomas Pringle, Finian McGrath, Maureen O’Sullivan and ex-Labour TD Patrick Nulty with a press conference scheduled for 23 March in Dublin. TheJournal.ie understands that former junior health minister Roisin Shortall and high-profile independent TD Shane Ross could also become involved along with independent MEP Nessa Childers. Members of political parties will be not allowed to join the network and those that do will be required to sign up to a manifesto-like document which discusses issues such as equality, human rights, and community. This will further fuel speculation that a new political party is in the offing, but such a prospect of has been ruled out in the short term. The main focus is on networking candidates and providing training, support and advice for people running in the 23 May elections. There will be one central website, to be launched by the middle of this month, where candidates and those involved can display their information such as biographies, policies and social media profiles. Those involved, including TDs, will be asked to formally sign up to the principles laid out in a document entitled ‘Independent Thought – United Vision’ which sets out a proposal to “work together for the improvement of society with a vision of making the State more responsive to the needs of citizens”. The document, which was published by this website recently, outlines areas where it is envisioned the loose alliance of politicians can cooperate on issues such as equality, personal debt, human rights, community and local government. The deadline for those parliamentarians who wish to get involved to sign-up to the document is this Friday. A press conference on 23 March will be preceded that same day by a workshop for local election candidates to give them advice on running campaigns. Email “Six TDs will launch a network of independent election candidates later this month ”. Feedback on “Six TDs will launch a network of independent election candidates later this month ”.